There are 11 volumes of Minute Books relating to Liverpool Football Club. The earliest of these dates back to 1894. Apart from Team Selection, meetings were primarily concerned with securing grounds and fields for the different teams each season. It appeares that Liverpool Cricket Club could not provide all the necessary accommodation for the growing Rugby club. One particular entry, from 7 September 1895, caught my eye. Liverpool’s Honorary Secretary was instructed to write to the Cricket Club asking to use their new club room as a Ladies Tea Room for the season. At the following meeting later that same month it was reported that the Cricket Club had wrote and agreed to this, providing: “… we make good any damage done.” This made me wonder just what sort of afternoon tea the ladies from Liverpool Football Club were having. Would the cake stand be thrown across the room if their team lost? I got the distinct impression the Football Club was not entirely welcome at the Cricket Club. I scanned the minutes looking for further entries concerning the ladies who just wanted to eat scones with friends and watch a game of rugby, cheering on friends and family. At a meeting on 20 January 1896 it was decided that ladies and members should now have to pay to go into the stands. This was the start of wider discussions about charging ladies and where they could sit. At the start of the 1896 season fields were rented at a nearby unnamed hotel. Here, a stand was erected and the decision was taken to charge ladies and members for access to the stand only, not the ground. This arrangement continued for many years until Lancashire County stepped in. The Lancashire v Cheshire match during the 1911/12 season was to be played at Aigburth. 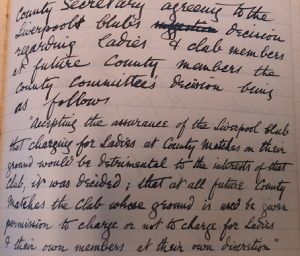 However, a meeting on the 25 September 1911 records that Lancashire County Committee had decided ladies and club members were to be charged to both the ground and the stand, while Lancashire County members should have free access to both. This caused some deliberation and Liverpool wrote to the County outlining their rules that ordinary members pay admission to the stand and Life members are entitled to free admission. Also during this season an England fixture was planned for December. A subcommittee was set up to make arrangements for this, including erection of stands and admission charges. It was decided to admit ladies free. While these preparations are being made Lancashire County Committee again contact Liverpool in November about another fixture. Use of the ground at Aigburth is requested for a Lancashire v Yorkshire match providing Liverpool agree to the ruling that ladies and club members be charged admission. Again there are discussions at the meeting and a new Bye Law is proposed: “That ladies be admitted to the ground free on all occasions, & that all members be admitted free of charge to all matches played on the ground.” Lancashire County Committee react by sending a deputation to Liverpool to see if the ruling on ladies admittance was irrevocable. When told it was, Liverpool were informed their ground would not be required for forthcoming games! However, Lancashire County later saw sense and at a meeting on 11 December 1911 it was reported that the Lancashire County Secretary sent a letter agreeing to Liverpool’s terms regarding ladies at future County matches. 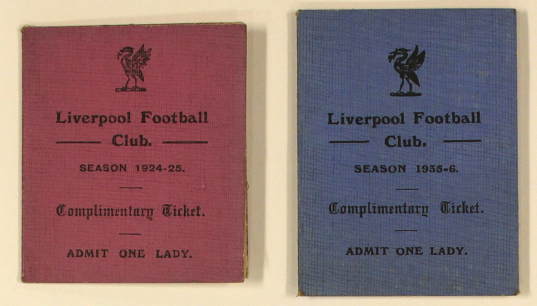 “Accepting the assurance of the Liverpool club that charging for ladies at County matches would be detrimental to the interests of that club, it was decided that at all future county matches the club whose ground is used be given permission to charge or not to charge ladies & their own members at their own discretion.” Liverpool’s insistence in not charging their female supporters had a great impact right across the whole county. Nevertheless, this was not the end of the issue. For the first season after WWI, 1919/20, women were charged admission to the ground for the first time. Again, at the start of the 1921/22 season minutes show this subject was once more debated by the Committee. Members voted against free admission for ladies, but a system of complimentary tickets for ladies was introduced; these would be issued to members for distribution. Throughout the 1930s, right up to the outbreak of WWII this system of complimentary tickets was in operation. A number of these complimentary tickets have survived and are present in the LSH archive. Who would have thought that ladies attending a rugby match would be such a contentious issue discussed over several decades?